WSM bears the initials of the surnames of its founders Dougles Wilson-Spratt and Jim McManus. These two built their first sporting coupe in 1961 on Austin-Healey Sprite running gear, with an aluminium body but polyester bonnet. The car performed well in rallies and sold well, especially in the United States. 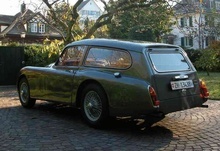 The car was followed by further WSM cars built on the running gear of an Austin-Healey 3000, one using an MG 1100, and at least one based on MGB engineering.